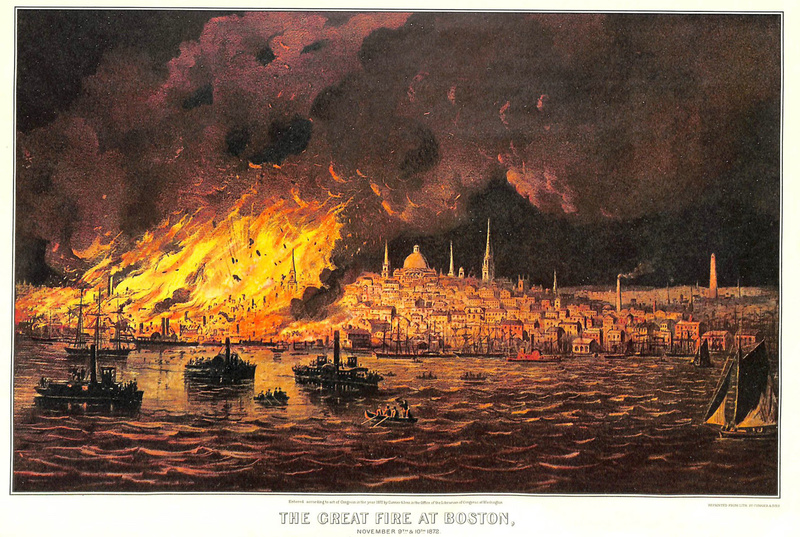 Today is the anniversary of the start of the Great Fire of 1872, which destroyed 776 buildings over 65 acres in downtown Boston (and which spread quickly in part because of the flu - which had stricken many of the horses that would otherwise have pulled fire engines to the scene). The Boston Architectural College Library posted this drawing of the fire tonight (the fire started around 7 p.m.). 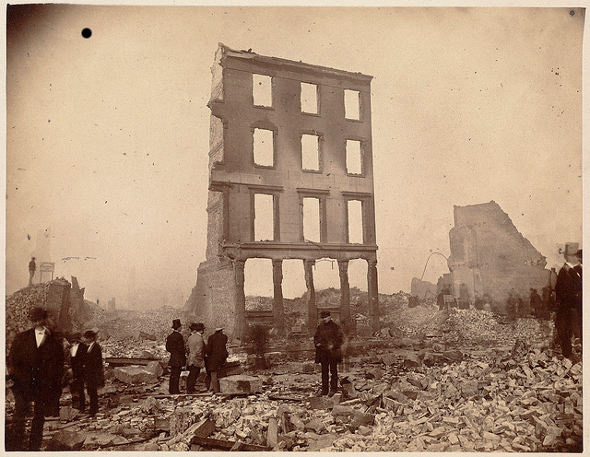 A fire that started in a downtown basement around 7 p.m. on Nov. 9, 1872, quickly spread and destroyed 776 buildings. Firefighters were hampered by the flu many of the horses that pulled fire wagons had come down with - and by the poor water pressure and bad zoning that Fire Chief John Damrell had earlier warned the city about. Photo from the BPL 1872 fire collection posted under this Creative Commons license. A fire that started in the basement of a dry-goods store at Summer and Kingston streets around 7 p.m. on Nov. 9, 1872 burned through the night and much of the next day - and brought firefighters, some by train, from as far away as New Haven and Worcester. 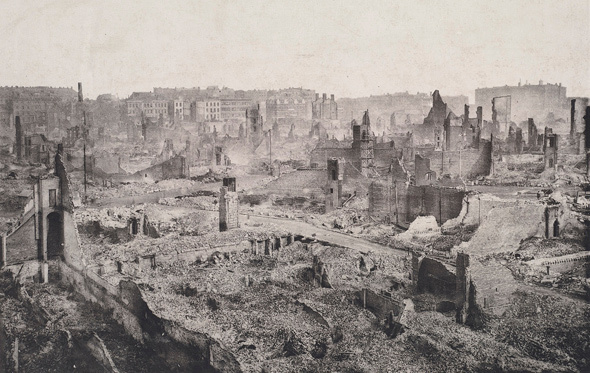 The Great Fire of 1872 destroyed 776 buildings across 65 acres of downtown Boston. To this day, nobody knows exactly what started it. The desperate fight was soon complicated by mobs of frenzied businessmen trying to salvage their wares and ledgers, looters eager to grab what they could, and hordes of curious onlookers. Since the fire was not threatening residential areas, many Bostonians viewed the blaze as an awesome spectacle. Gawkers — by some counts as many as 100,000, many of them drunk — added to the firefighters' struggle. The Fire Department's response was also hampered by the flu - not among firefighters, but among the horses that would normally pull firefighting equipment. Inadequate water pressure and inadequate building codes - both things Fire Chief John Damrell had warned about - also contributed to the fire's spread.